4160Tuesdays has launched Paradox, a "perfume for a parosmic". A portion of the proceeds will benefit Fifth Sense. 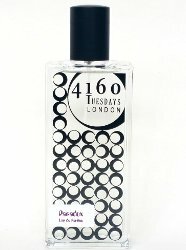 4160Tuesdays, the London indie perfumery, has released Paradox, a citrus, iris, violet and musk fragrance, created by perfumer Sarah McCartney for a friend with a damaged sense of smell. Each bottle will raise funds for Fifth Sense, the UK organisation for people with smell and taste disorders. Paradox was made with Louise Woollam who lost her sense of smell after a viral infection. As a perfume and cosmetics blogger (Get Lippie) Louise was devastated, but as her sense started to return, the situation got worse. Her brain interpreted coffee, vanilla and sweet smells as sewage. Louise identified citrus fruits, ionones (violets and iris) and musks as three accords which her sense of smell was interpreting correctly. Louise tweeted hoping to find a fragrance with these notes, and Sarah answered offering to make one for her. The notes feature grapefruit, yuzu, orange flower, violets, petitgrain, musk and iris. 4160Tuesdays Paradox is available in 9, 30, 50 and 100 ml Eau de Parfum. The back story is great and would totally sell me! Great cause and what a great thing to do for a friend! Now, when you compare the motivation behind this scent and DY Bubblegum rings, which one would most of us choose? I know that it’s not exactly the same concept, but this brings to mind Eau Pear Tingle by Opus Oils.